Surface meteorological parameters (i.e. air temperature, pressure and relative humidity, and rainfall and downwelling shortwave radiation) are recorded at 10 minute intervals at the NERC MST radar site (52.42°N, -4.01°E, 50 m above mean sea level; British National Grid Reference: SN637826). Data are available from 25th July 2000 to the present. There are a number of gaps in the dataset owing to instrument problems and down-time for maintenance. Campbell Scientific 107 thermistor temperature probe mounted inside a URS1 unaspirated radiation shield. Accuracy: +/- 0.4 °C. Vaisala PTB101B barometric pressure sensor. Accuracy: +/- 2.0 hPa. (Vaisala) HMP45C temperature and relative humidity probe (from which only the humidity measurements are used) mounted inside a URS1 unaspirated radiation shield. Accuracy: +/- 0.3%. (Environmental Measurements) ARG100 tipping bucket raingauge. Note that occasional build-up of fungus within the inlet tube can impede or even completely inhibit the flow of rain into the instrument. This makes the rain data the least reliable of the surface meteorological measurements. 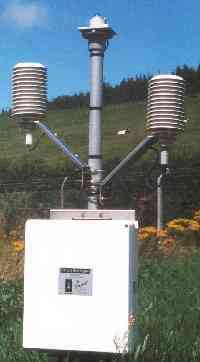 (Kipp and Zonen) CM3 thermopile pyranometer (WMO second class). Accuracy: +/- 0.5%. The raingauge is located on the ground. All other sensors are mounted on a post approximately 1 m above the ground. The data logger initially samples the atmospheric temperature, pressure and humidity sensors at 5 s intervals. Mean values are calculated over each 60 s and the outputs from the logger represent minima, means and maxima of these 60 s means over each 10 minute sample period. The data logger initially samples the tipping bucket raingauge every 1 s and records a tip for each 0.20 mm accumulation of rain. The output from the logger represents the total accumulation of rain over the each 10 minute sample period. The data logger initially samples the pyranometer every 5 s and records the downwelling radiation (within a hemispheric field of view) with a flat response in the spectral range 305 - 2800 nm. The output from the logger represents the accumulation of energy per unit area within each 10 minute sample period. The measured radiation is compared with that predicted for the logger's latitude and longitude, and for the time of year and the time of day (assuming clear sky conditions). A sunshine priod is defined as one in which the ratio excedes 0.4 and the output from the logger represents the accumulated sunshine duration within each 10 minute sample period. Note that this is an estimated product, which is not derived according to the WMO definition of sunshine duration.